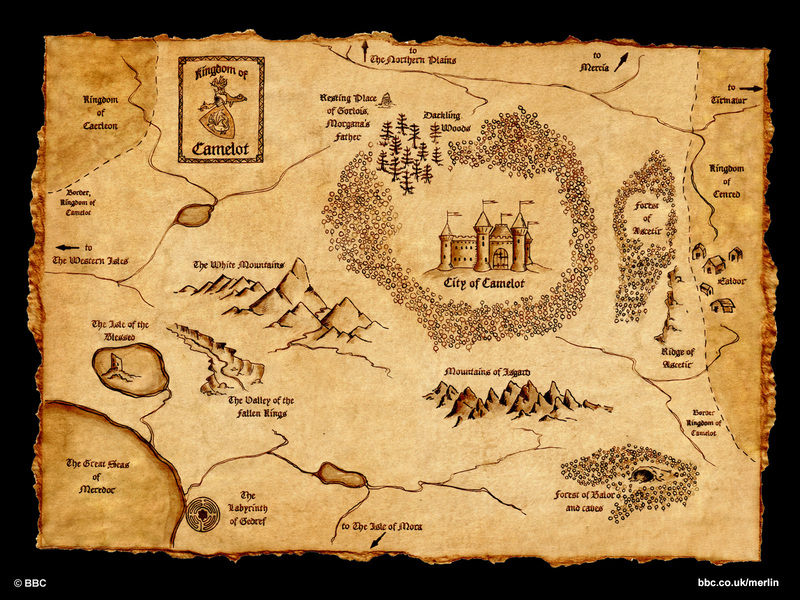 To be precise, a map of the Kingdom of Camelot as put together by the creators of BBC’s Merlin. This doesn’t explain how the geography seems to move about in direct correlation to how long the script writers need Arthur/Merlin/the Knights etc. to be on the road but it does give a little insight into how it all fits together. It does however give credence to the three days it took Arthur and the knights to get to the Isle of the Blessed in S4E1/E2 given that they would have had to cross a mountain range and the Valley of the fallen Kings. However I think that the script writers might have swapped the mountain and the valley for the majority of the plots involving the Valley as Arthur and Merlin seem to be able to get there an back in a day. Anyhow, it’s an interesting insight into how the landscape was first envisioned, regardless of whether it actually works or not! In ‘This is the beginning‘ (my Season 4 Merlin fan fic which will be finished eventually, promise!) everything is as above apart from my renaming Caerleon. Dumnonia – Ruled by King Cador and to the south west, below the Labyrinth of Gedref. Glysswing – Ruled by King Tewdrig and to the north west, this is what I have renamed Caerleon as Caerleon is a town not a kingdom in Wales. Powys – Ruled by Cygen and also to the north west, above to Glysswing. Anything else I add that I can locate, I’ll update as I go. No not really. I find it interesting to look at how TV shows I enjoy are put together, both as a fan and as a writer. I only comment as a professional in these matters. I'm not hiding behind an anonymous face, only because I have no identity on the web. I think its a shame that an overly analytical view is given to something which is created for enjoyment of a hugely wide ranging spectrum of the populace by a very small minority who try to pick historical and cartographical holes in a fictional television series. You need help. You need to get out. And I don't mean to Camelot! Each to his own, whoever you are. I am not sure why a small blog post should upset you so much. After all, as you point out, this is a fictional show I'm talking about and how I spend my time is nothing to do with you. I hope that whatever is going on in your life to make you so miserable and angry that you feel the need to insult strangers passes quickly. Hi Kizzia. I stumbled over your blog when I searched for maps on Camelot. Like you I enjoy the Merlin TV-series, and I also like to write fictional stories. I think it is creative and fun that your write your own stories. What did you think of the season 4 ending? I myself think it was sad. I have spent time thinking of how the series could continue, perhaps with focus on Arthur as the future king. I wont say more because I don´t know how much you have seen in the serie, and don´t wont to give away spoilers. I meant season 5 and not 4, I apologize for that. I see you like Tolkien and other great authors, then perhaps you like C.S. Lewis books also?